DMK members today raised 'Dam 999' movie issue in Lok Sabha. They demanded a ban on the movie's release in India. 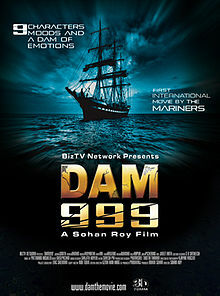 The movie 'Dam 999' is expected to release on 25 November 2011. DMK members rushed to the well of the house waving out clippings of a newspaper report on the issue complaining that the story of the movie 'Dam999' was based on Mullaperiyar Dam over which Kerala and TamilNadu are in dispute. Prime Minister Manmohan Singh and UPA chairperson Sonia Gandhi, who were in the House, called Mr. Balu, DMK Parliamentary Party leader, and discussed about the issue.They assured him that they would talk to Information and Broadcasting Minister, Ambika Soni on this issue . 0 Response to "DMK raises 'Dam 999' issue in Lok Sabha"